Members of Modi's Bharitaya Janata Party have demonstrated their power to oppresss Muslims, wade into censorship and police the arts. With the swearing in of Narendra Modi as prime minister on May 26, India will have a government led by a man whose political education was acquired not in a democratic, secular and often rambunctious national parliament but in an intolerant, disciplined Hindu nationalist organization unashamedly influenced by 1930s European fascism, complete with theories of a master race. The potential danger to Indian democracy and minority rights has never been this acute since the country’s independence in 1947. Indira Gandhi’s suspension of civil rights in the 1970s silenced critics but did not threaten fundamental institutions in the long run, and voters were able to reverse what she had done in one decisive trip to the ballot box. In today’s India, promoters of the most radical fringe of Hindu nationalism within Modi’s Bharatiya Janata Party (BJP) want to constrict Indian diversity and enforce an imagined civilizational purity they call Hindutva. Their campaign has already demonstrated its power to oppress and kill Muslims, destroy their mosques, force the “reconversion” of Christians and Buddhists, wade into censorship, limit critical or analytical scholarship and police the arts. Hindu zealots drove the country’s most celebrated painter, M. F. Hussein, into self-imposed exile in London, where he died in 2011. At the center of secular Indian concern is the largest of the Hindu nationalist groups, the Rashtriya Swayamsevak Sangh (RSS), founded in 1925. In 1947, independent India’s first prime minister, Jawaharlal Nehru, sent a letter to political officials in Indian states, asking them to beware of the movement. “We have a great deal of evidence to show that the R.S.S. is an organization which is in the nature of a private army and which is definitely proceeding on the strictest Nazi lines,” he wrote. Rajiv Gandhi, his grandson and prime minister from 1984 to 1989, reiterated the fear of Hindu nationalism in an interview with me just before his assassination in Tamil Nadu in 1991. He was at the end of a grueling campaign to return the Congress party to power, and he said his hope was that he could block the political rise of Hindu fundamentalists. The RSS is the organization that took Modi in as a young man and nurtured him. Critics will be watching to see if he can, in national office, rise above the narrow RSS vision of what India should be. Much of his troubling history is glossed over inside India and abroad in the rush toward economic growth in a climate designed to please corporations and international investors and boost the economy for all, an attractive prospect for India’s restless young people. It is universally acknowledged that as chief minister of Gujarat state—akin to an American governor—Modi’s record was stellar. Though a solitary, ascetic, quirky character personally, he completed large public projects at a rate most of India has never managed. Infrastructure was improved, corruption in the bureaucracy attacked, red tape ripped away and the state’s door opened to business and corporate interests. American delegations, including members of Congress, turned up in Gujarat to hear his pitch, even though Modi was denied entry to the United States because of allegations that he condoned or did not stop, a pogrom against Muslims in 2002, in which between 1,000 and 2,000 died and many thousands lost their homes and businesses. Mr. Modi’s critics can be forgiven for feeling a knot in their stomach today, but this is not the first time the Indian electorate has ignored the unpleasant baggage a candidate brings and been seduced by the dream of technology, development and corruption-free government. In December 1984, Rajiv Gandhi won 404 seats barely a month after his Congress party presided over the mass murder of Sikhs in Delhi, Kanpur, Bokaro and other north Indian cities. Like Modi, Rajiv Gandhi appealed to young voters and the corporate sector. Despite the power he enjoyed, he still was unable to make big changes, in large part because of political pushback. 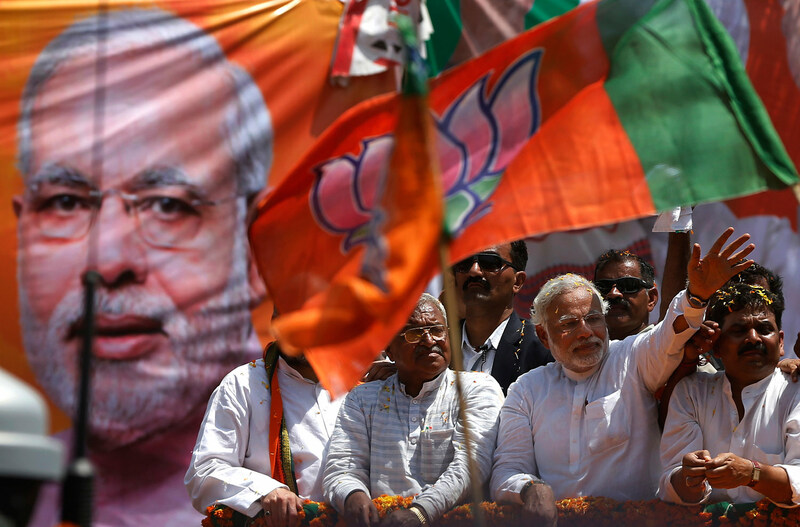 As India’s prime minister, Modi is a newcomer to national politics, and Delhi is not Gujarat. His “presidential,” often autocratic style will encounter checks in the Indian parliament and in bureaucratic institutions that served Congress party leaders for decades. Even the intelligence agencies, domestic and foreign, have long been tools of Congress prime ministers. Modi may have won a majority of seats—282 in a lower house of 543, with the Congress party reduced to a humiliating forty-four seats—but political analysts in India calculate that he garnered only 31 percent of the popular vote. While there will not be an official political opposition at least at the start, because no other party rose to the required level of 55 seats, India’s politicians are quick to form coalitions to mount challenges or delay legislation in raucous debates. There are still other Gandhis in the wings on both sides of the political divide, should the new order in Delhi stumble. Priyanka Gandhi Vadra, the sister of Rahul (who led the Congress party to ignominious defeat at the polls) is a stronger public speaker whose presence reminds many people of her grandmother, Indira Gandhi. Priyanka may be willing, or persuaded, to relinquish her private life for politics. Varun Gandhi, first cousin of Rahul and Priyanka, won a parliamentary seat for the BJP and, given voters’ fascination with the Gandhi dynasty, he could rise in the party as a challenger to some of its older leaders. Corruption and criminality among politicians remain serious problems on a scale Modi may find hard to tackle. After election results were declared, The Hindustan Times published the findings of two nongovernmental organizations tracking malfeasance. The two groups, National Election Watch and the Association for Democratic Reforms, looked at affidavits on 541 winners of parliamentary seats from all parties and found that 34 percent have declared criminal cases against them, up four percentage points from the last national election in 2009. Ironically, the rates of alleged criminality were higher among BJP members of parliament than among elected Congress politicians—22 percent for the BJP and 7 percent for Congress. BJP members also led Congress 4 to 1 on allegations of murder. The faltering Indian economy, which Modi promised to reenergize, has some big hurdles, including low (for India) growth figures and entrenched political resistance to foreign involvement in the country’s development and commerce. International trade lags, and the US-India nuclear energy agreement negotiated by the Bush administration against the advice of numerous nuclear experts has yet to be benefit American companies because of unprecedented demands made on foreign partners. The World Bank ranks India 134 out of 189 countries in ease of doing business.